Westfield Vermont, nestled in the heart of Vermont’s Northeast Kingdom, is the least densely populated community in Orleans County. Although the land was chartered in 1780, it wasn’t settled until nearly 15 years after the Revolutionary War, at which time the Hobbs, Burgess and Hartley families moved into the area from Rhode Island. The Famous Bayley-Hazen Military Road ended here. 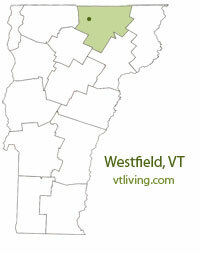 To share Westfield, VT information, contact us. Learn more about advertising in VTLiving.